Nature has had billions of years to perfect photosynthesis, which directly or indirectly supports virtually all life on Earth. In that time, the process has achieved almost 100 percent efficiency in transporting the energy of sunlight from receptors to reaction centers where it can be harnessed — a performance vastly better than even the best solar cells. One way plants achieve this efficiency is by making use of the exotic effects of quantum mechanics — effects sometimes known as “quantum weirdness.” These effects, which include the ability of a particle to exist in more than one place at a time, have now been used by engineers at MIT to achieve a significant efficiency boost in a light-harvesting system. Surprisingly, the MIT researchers achieved this new approach to solar energy not with high-tech materials or microchips — but by using genetically engineered viruses. This achievement in coupling quantum research and genetic manipulation was the work of MIT professors Angela Belcher, an expert on engineering viruses to carry out energy-related tasks, and Seth Lloyd, an expert on quantum theory and its potential applications; research associate Heechul Park; and 14 collaborators at MIT and in Italy. Lloyd, a professor of mechanical engineering, explains that in photosynthesis, a photon hits a receptor called a chromophore, which in turn produces an exciton — a quantum particle of energy. This exciton jumps from one chromophore to another until it reaches a reaction center, where that energy is harnessed to build the molecules that support life. But the hopping pathway is random and inefficient unless it takes advantage of quantum effects that allow it, in effect, to take multiple pathways at once and select the best ones, behaving more like a wave than a particle. That’s where the virus comes in. By engineering a virus that Belcher has worked with for years, the team was able to get it to bond with multiple synthetic chromophores — or, in this case, organic dyes. The researchers were then able to produce many varieties of the virus, with slightly different spacings between those synthetic chromophores, and select the ones that performed best. 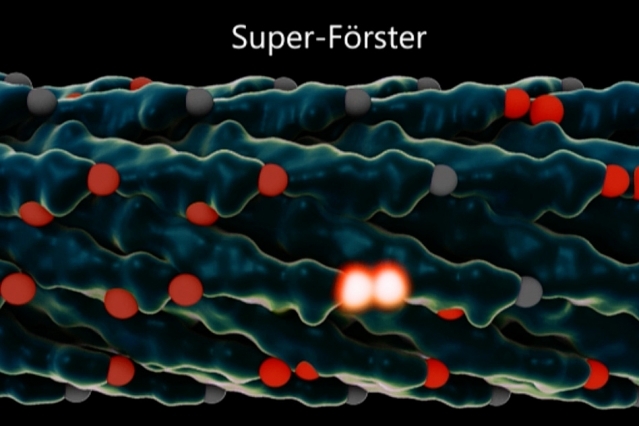 In the end, they were able to more than double excitons’ speed, increasing the distance they traveled before dissipating — a significant improvement in the efficiency of the process. The project started from a chance meeting at a conference in Italy. Lloyd and Belcher, a professor of biological engineering, were reporting on different projects they had worked on, and began discussing the possibility of a project encompassing their very different expertise. Lloyd, whose work is mostly theoretical, pointed out that the viruses Belcher works with have the right length scales to potentially support quantum effects. In 2008, Lloyd had published a paper demonstrating that photosynthetic organisms transmit light energy efficiently because of these quantum effects. When he saw Belcher’s report on her work with engineered viruses, he wondered if that might provide a way to artificially induce a similar effect, in an effort to approach nature’s efficiency. Within two weeks, Belcher’s team had created their first test version of the engineered virus. Many months of work then went into perfecting the receptors and the spacings. Once the team engineered the viruses, they were able to use laser spectroscopy and dynamical modeling to watch the light-harvesting process in action, and to demonstrate that the new viruses were indeed making use of quantum coherence to enhance the transport of excitons. While this initial result is essentially a proof of concept rather than a practical system, it points the way toward an approach that could lead to inexpensive and efficient solar cells or light-driven catalysis, the team says. So far, the engineered viruses collect and transport energy from incoming light, but do not yet harness it to produce power (as in solar cells) or molecules (as in photosynthesis). But this could be done by adding a reaction center, where such processing takes place, to the end of the virus where the excitons end up.